Culinary entrepreneur and Michigan native Nick Neveau has opened the newest location for Fire & Rice, a catering company that specializes in the festive Spanish dish called paella. Neveau prepares paella using traditional techniques and ingredients including rice from the Valencia region of Spain and saffron from Afghanistan. Preparing paella is part performance art as the chef mixes the ingredients over an open flame in front of guests at parties, corporate events, festivals and farmers’ markets in and around the greater Ann Arbor area. “We make paella just like generations of Spaniards do in large pans over a flame,” says Neveau, a veteran of the restaurant business who previously served as the culinary director for Tony Sacco’s Coal Oven Pizza. Pronounced “pah-ay-a,” families in Spain traditionally prepare seafood and meat paellas in a large shallow pans over a fire outdoors during family gatherings. 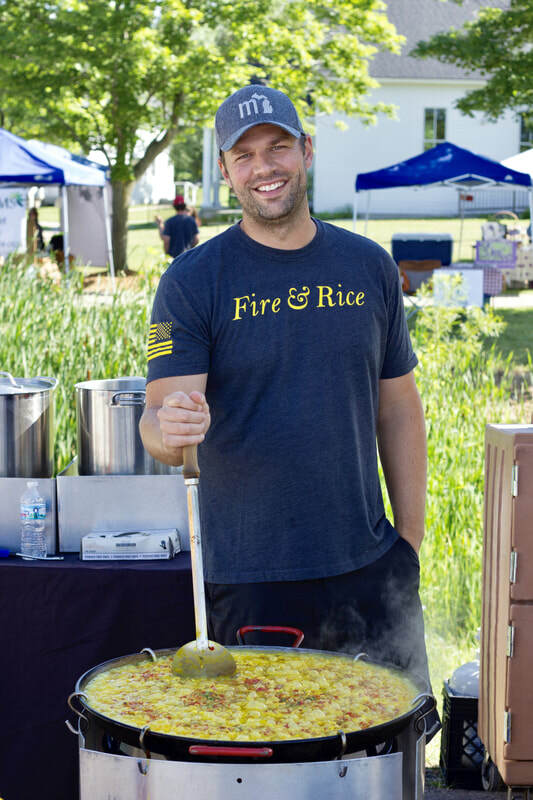 Fire & Rice Founder and U.S. Air Force Veteran Paul Schmidgall learned how to make paella from elderly señoras on the Spanish island of Minorca while he was on leave from his military assignment in Germany. Fire & Rice is a catering company specializing in preparing paellas for corporate events, private parties, family reunions, farmers’ markets, festivals and other social gatherings. Fire & Rice chefs prepare the Spanish dish of rice, saffron, seafood and meats in a large shallow pan over an open flame using traditional ingredients and methods. Chefs arrive with all the equipment and utensils, preparing the meal in front of the guests. Headquartered in Naples, Fla., the company has expanded to Connecticut, Michigan, Tennessee, & South Carolina.